One of the advantages of having an ocean for a back yard - apart from not having to mow it or weed it - is the easy access to one of the most relaxing of recreational pursuits - kayaking. The ocean waters of Georgia Strait surrounding the Comox Peninsula are usually calm enough for the most unsteady beginner. With the beach just a few meters away, launching your kayak couldn't be easier. Guests at Copes Islander Oceanfront B&B can bring their own equipment or rent it from local outfitters. Kayak rental and delivery can be arranged with Comox Valley Kayaks. Click on the following link for rental information and pricing: Kayak Rentals . There are many other great kayaking locations in the Comox Valley. The Courtenay River Estuary is a mecca for numerous species of waterfowl. Baynes Sound offers calm ocean waters. 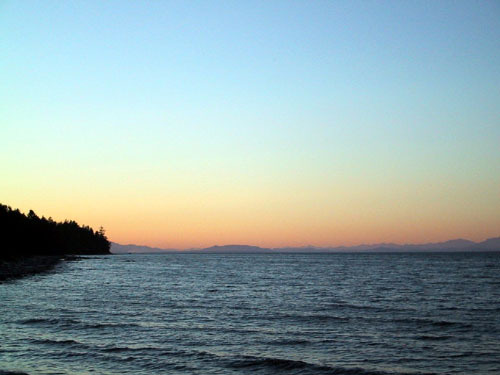 Comox Lake is another popular location in the area.